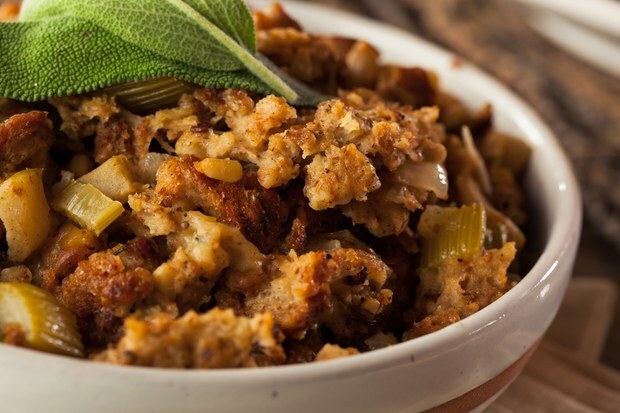 This is a healthier, vegan version of a stuffing my grandmother would make. You can easily make it gluten-free by using GF bread or packaged GF stuffing cubes. If you are new to roasting chestnuts, you can easily learn the process online, e.g., in this illustrated guide. It's also possible to buy roasted and peeled chestnuts in packages if you're short on time, but I encourage you to learn the process as you'll have access to a delicious snack all winter long. Preheat oven to 350 degrees. Lightly oil a 9x13” baking dish. In a large skillet, heat olive oil over medium heat, and cook onion until it begins to soften and turn translucent. Add celery and cook 1-2 minutes, then add mushrooms and sage and cook until they soften and begin to shrink. In a large bowl, combine cooked veggies with all remaining ingredients, being sure to stir well so all bread cubes get moistened. You may add more or less of the broth, depending on whether you want a wetter or drier stuffing. Arrange stuffing evenly in the baking dish, and bake for approximately 1 hour. Cover with foil if it begins to dry out or is browning too fast. Keep covered until ready to serve.